All You Need Is Love…And? Fifteen of the novels I’ve written are love stories. I guess you can say that I love love. I got up in the wee hours to watch Prince Harry marry Meghan Markle (just like I got up to watch Prince William and Catherine Middleton’s wedding and even though I was young at the time, Charles and Diana). The other morning as I sat riveted in front of the TV, I couldn’t help but cry as Meghan walked down the aisle. Because I want them to make it! I want them to have found happiness and true love and a long lifetime together. So there I was, sitting in front of my TV in my pajamas soooo early in the morning rooting for them and their love. I think that love of love is what drives me to write romance. But even so, I have to disagree with John, Paul, George, and Ringo just a little bit. Two weeks ago today, we moved into a new home. (we are still surrounded by boxes so although we have “moved” we aren’t done “moving in!”) Since then, my husband and I have unloaded a lot of furniture, built two fences, and put together a large above ground swimming pool that promised to be easy but in reality was not. And I joked to someone recently that we’d done those things and remained married so I was calling it a win. 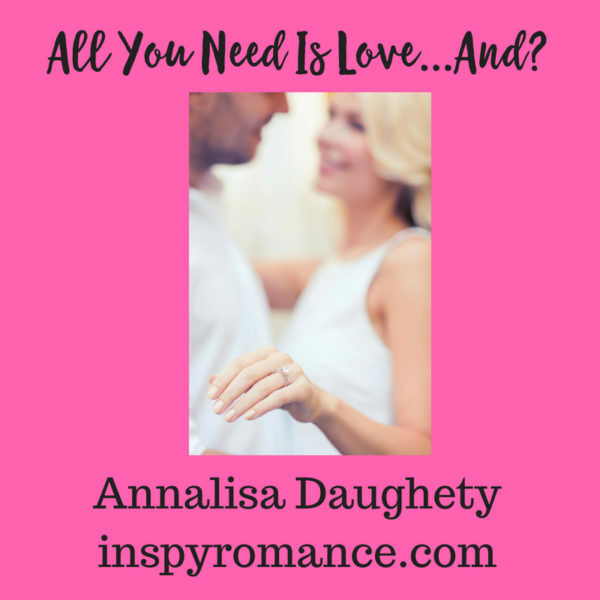 And the idea that “all you need is love” is definitely missing some important ingredients. Like kindness. Patience. Communication. Commitment. Prayer. Relationships need all of those things to thrive and survive. My next release, A Reservation for Romance features characters who have both been married previously. It’s been interesting to tell their story, because I think they know better than any of my previous characters just how important those other ingredients are. They’ve known love before, which has made them both much more cautious as they seek it again. They know that love alone isn’t quite all they need. As for me, I will confess that selling/buying/moving and all that goes along with those things have been stressful. It would have been easy to have taken out my frustrations by snapping at my husband (and vice versa). But at the end of the day, even after being exhausted from working and moving and building projects, I’ve reminded myself that we’re on the same team. Moving is stressful, but those stressors are short-lived. We have to work together to get through this part so that we can enjoy our new home and all our new town has to offer. How about you? What other relationship ingredients would you add to the song All You Need is Love? Marriage Is hard it does take everything you said and love There is always up and downs. I love read books about second chances and happy ending. Thanks, Brenda! You are exactly right. Hi Annalisa! Thanks for sharing your life with your readers. I was 14 when the Beatles became known in the US. In April hubby and I saw the group 1964 The Tribute at our local theater. This band members look like the Beatles and uses period instruments and amplifiers. They sing like the original group. It was a fun night down memory lane. You can google their name to see if they will be touring near where you live. So to add to the Beatle song – 1. Corinthians 13 comes to mind. Love is patient and kind – only way I am still married to my hubby for 45 years. This week has been rough and I am biting my tongue not to say something unkind, even though at times I am thinking it. I have moved 20 times in my life and understand the stress. Three times I moved twice within a year, twice on Valentine’s Day, and once on our anniversary. We have been in our present home for 18 years. Not sure I am up to any more moves. Best wishes and Happy writing. Hi Annalisa. 1964 The Tribute will be preforming in Tulsa, Oklahoma in July and in Tennessee in August. Thanks, Renate! I’ll definitely keep an eye out in case they are ever in my area! Ah, yes…all you need is love. If it makes you feel better, I was singing the song before I even opened the blog, just the title had me going, lol! I agree with all your other “ingredients” as well, patience and communication being high on my list! Thank you for sharing and I wish you the best on your new home!! I’d include trust with your list. I love the Beatles too. We listen to a lot of 60’s and 70’s music in our house. All the ingredients you mentioned plus humor. Humor gets us through a lot at our house. I’m in the process of cleaning our above ground pool. Yuck. But once it’s all cleaned out and filled with fresh sparkling water, we’ll enjoy it. I keep telling myself that as I scrub. All You Need is Love but Everyone Needs Jesus. Now I have that song running through my mind. Being patient when you are dealing with frustrations and when your partner can(even though they might NOT realize it) push you to your limits and tries to make you mad by being stubborn or asking repeatedly asks for help. Also just daily stresses or triggers that they are tempted to try. I am NOT saying I have a stressful life, cause God helps me each and everyday and He is there with me. Another is that marriage is blissful and happy, but you need to be Thankful for what you have and appreciate your partner. You need to show appreciation for and to your partner by helping them out, caring for them, noticing what they do towards the other person and those around them. Be tough and strong no matter what and even if your partner/spouse DOES not show it back.